PENGUIN FILTRATION SYSTEMS are available in numerous sizes to serve all medium and large volume tanks. All material in contact with the solution is high temperature CPVC providing a highly corrosion resistant filter system with no wearing parts. As an option, most systems, both pumps and chambers, are available in polypropylene. All Penguin Series A filter systems are fully equipped and ready to operate including 20 feet of reinforced braided hose, all necessary clamps and fittings, drain valve, flow control valve, and initial set of Penguin PF filter cartridges (15 micron unless otherwise specified). Those systems, which incorporate series 6C filter chambers also include PG series pressure gauge and guard assembly and vent valve. Penguin P series pumps are equipped with TEFC motors with an over-sized bearing set for easy replacement, and an epoxy coated motor housing for acid resistance. All single phase motors are supplied with a 6’ cord/grounding plug and three phase motors are shipped unwired. PENGUIN SERIES A-A IN-TANK PUMP OUTSIDE FILTRATION SYSTEMS are designed with a series P pump and series C chamber. Systems are ruggedly constructed, corrosion- resistant, and designed for continuous operation with no metal-to-liquid contact. The Series A filtration system is versatile and easy-to-install, because both pump and filter chamber are independent units. Simple-in-design and efficient in performance, requiring small floor space. Series A filtration systems are available in numerous sizes to serve all medium and large volume tanks. All material in contact with the solution is high temperature CPVC providing a highly corrosion- resistant system. Pumps and chambers, are available in CPVC, PVDF or Polypro. Penguin P series pumps are equipped with TEFC motors with an oversized bearing set for easy replacement, and an epoxy-coated motor housing for acid resistance. All single-phase motors are supplied with a six-foot cord and grounding plug and three-phase motors are shipped unwired. The P series pumps are in-tank, sealless, bearing-free, and self-priming when immersed, to supply maintenance free operation. P series pumps can even run dry without damage. PENGUIN SERIES A-A and A-B IN-TANK FILTRATION SYSTEMS incorporate the P series pumps and C series chambers. They are compact, corrosion-resistant, and metal free, requiring no floor space. If desired, both system types can be mounted outside the tank. Unlike one-piece submerged filtration systems, A-A and A-B filtration systems need not be removed from the tank for cleaning or cartridge change-out. Designed for sealless-free, bearing-free and maintenance-free operation, the chamber cover on single cartridge chambers can be easily removed by hand, and a new replacement cartridge dropped in. The Penguin design incorporates leak-proof filtration with no liquid bypass. All chambers accommodate Penguin PF string-wound or PC carbon filter cartridges. The P series pumps are standard on the A-A / A-B series and are constructed from either CPVC, Polypropylene or high temperature PVDF. Most pumps come with an epoxy-coated motor housing for corrosion resistance and are equipped with a totally enclosed fan-cooled motor with an oversized bearing set for easy replacement. Single-phase motors are equipped with a cord and grounding plug. Three-phase motors are shipped unwired. P series pumps are self-priming when immersed in solution and can run dry without damage. Series A-A and A-B filtration systems are available in 6 models to service small and medium volume tanks. 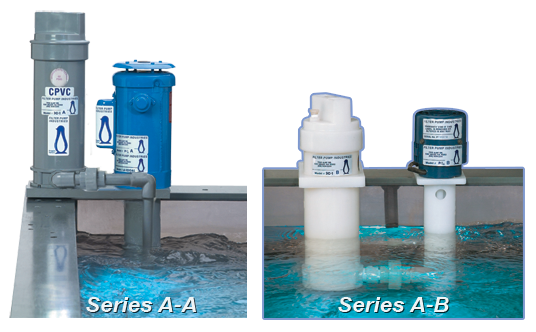 Series A-B filter systems are available in 11 models to accommodate larger volume tanks. All materials in contact with the solution are high temperature CPVC, which provides a highly corrosion-resistant filter system with no wearing parts. Both series can be supplied in polypropylene or PVDF. Consult the factory for details. Penguin Series A-A and A-B combine P-1/15A pumps and 3C filter chambers to produce a reliable, economical filter system. Penguin Series A-AS/A-AL feature P-1/6A, P-1/4A pumps and 3C filter chambers. Penguin Series A-AS/A-BL have P-1/6A, P-1/4A, P-1/2A, P-3/4A, and P-1A pumps combined with 3CN and 6CN filter chambers. The AL and BL series provide a higher flow for continuous filtration, agitation, and extended filter cartridge life. As an option, all A-A, A-S, and A-L filter systems can be supplied with solid piping. Penguin P series pumps are equipped with a totally enclosed fan cooled motor with an oversized bearing set for easy replacement. The P-1/4A, P-1/2A, P-3/4A, and P-1A pumps are sold as standard with an epoxy coated motor housing for acid resistance. Single phase motors are equipped with a cord and grounding plug. Three phase motors are shipped unwired. PENGUIN SERIES A-SF IN-TANK SUCTION FILTRATION SYSTEMS are ruggedly constructed from CPVC, Polypro, or PVDF with no metal contact Thus, are corrosion- resistant and are designed for continuous-duty operation and virtually trouble-free service. Series A-SF filtration systems are easy-to-install and maintain, offering filtration rates up to 3400 gph. Choose from a variety of filter cartridges with or without carbon filter media. Series PF standard string-wound filter cartridges for particulate removal, or Series GC granular carbon for removing organic contaminates. PENGUIN SERIES BF BAG FILTRATION SYSTEMS are designed to provide rapid, high velocity solution turnover, while removing contaminants that tend to “surface load”. The larger surface area of the single layered polypropylene filter bag provides significant longer life when compared to a graded density, string wound cartridge filter. One PB-7, 7” diameter by 16.5” long, bag is equivalent to approximately twelve 2.5” diameter by 10” long string wound filters. Disposable bags are economical to use and may be easily discarded when spent or cleaned for reuse.Penguin bag filtration systems are corrosion-resistant, metalless, confined to the tank compact, and require no floor space. These systems can be mounted as an in-tank or out-of-tank pump with a tank lip-mounted bag stand. The materials in contact with the solution are CPVC and polypropylene, thus providing a highly corrosion-resistant filter system. Series BF bag systems include a flow control valve and a bypass valve for liquid transfer. For easy filter bag cleaning or replacement, a polypropylene quick disconnect coupling is supplied. A polypropylene bag adaptor head with CPVC split ring is provided to firmly secure the bag in place and to prevent it from accidentally detaching itself from the adaptor head. Bag adaptor heads are available with 1” or 11/2” FNPT openings. Penguin polypropylene single layered felt bags are available in micron ratings from 1 to 100. Polypropylene mesh monofilament bags are available in micron ratings greater than 100 micron through 300 micron. Bag rings are fabricated in PVC coated steel or optional 316SS. Bags are offered with nominal 5” and 7” diameter openings in single and double lengths. Penguin Series P sealless vertical pumps employed on bag systems are constructed of CPVC with a viton elastomer and a high temperature PVDF impeller as an option. There is no liquid to metal contact. These pumps are compact, portable, and self-priming when immersed in solution. Because of their unique impeller design, these pumps have no mechanical seals, no pump bearings, no bushings, no wearing parts, and thus have almost unlimited dry run capability. Series P pumps are simple in design and efficient in performance, while requiring little or no maintenance. PENGUIN SERIES HF HORIZONTAL CENTRIFUGAL FILTRATION SYSTEMS are constructed of high temperature CPVC with viton elastomers, thus excellent for most corrosive chemicals and capable of pumping solutions to 180ºF max. Equipped with the Penguin Series HV horizontal volute pump, or on larger systems the Series HN centrifugal pump and the rugged Penguin CPVC filter chamber, HF filter systems are designed for continuous high temperature operation. When the optional double mechanical seal with the water flush is incorporated onto the pump, the HF system provides excellent filtration for electroless nickel and copper solutions to 180ºF max. These systems also are recommended for acid and alkaline solutions. The larger HF filter systems provide a high volume, high pressure filter system to which casters can be added for portability. Penguin HF filter systems are easy to clean and simple for filter cartridge replacement. The easy grip handles require no tools to release the filter chamber head. • Plating Solutions 180ºF max. SERIES SM FILTRATION SYSTEMS are designed to provide a complete, ultra compact, portable, and leakproof filter system. They are equipped with the Penguin M series polypropylene magnetic drive pump and the rugged Penguin CPVC or polypropylene filter chamber. SM filter systems are a simple, economical and efficient for filtering and circulating acid and alkaline solutions. The smaller compact SM filter systems are excellent for complete corrosion resistant filtration in laboratories, pilot plants, and production applications. Penguin SM filter systems are easy to clean and simple for filter cartridge replacement. The single threaded head with the easy grip handle requires no tools to release the filter chamber head. There is no dismantling and no danger from breakage. Penguin filter chambers are constructed of CPVC or polypropylene to 180ºF max and feature completely leakproof filtration. Penguin filter chambers have no fragile lucite or glass. They can accept either Penguin PF, PC, or PP series filter cartridges or optional PS filter sleeves. The M series pumps, constructed of polypropylene are magnetically driven. The only moving part in the pump is the polypropylene encapsulated impeller magnet assembly, which rotates on an internal pure ceramic spindle up against a ceramic thrust washer. Because the pump is sealless there is no leakage due to seal wear. An oversized priming chamber can be added to facilitate priming the pump. PENGUIN SERIES MF MAGNETIC DRIVE PUMP FILTRATION SYSTEMS are specifically designed for leakproof filtration and circulation. Equipped with a Penguin M or MT series PP/Kynar magnetic driven pump and the rugged Penguin CPVC, PVDF or polypro filter chamber, MF filtration systems are designed for continuous trouble-free service. The smaller compact MF filter system is excellent for complete corrosion-resistant filtration in laboratories, pilot plants and production applications. The larger MF filtration system provides a high volume, high-pressure system to which casters can be added for portability. Simple in design and efficient in performance, these systems are recommended for acid and alkaline solutions. Applications include all precious metal plating solutions, high chloride, sulfuric, and alkaline cyanide solutions. MF filtration systems are easy-to-clean and simple for tube replacement. The single-threaded head and the easy access to chamber head, requires no tools. Penguin filter chambers are for use up to 180ºF and have no fragile Lucite® or glass. They accept Penguin PF series filter cartridges. All Penguin filtration systems are fully equipped and ready-to-operate including valves, polypropylene base, drain valve, flow control valve, and initial set of Penguin PF filter cartridges (15-micron unless otherwise specified). Systems, which incorporate a series 6C, 8C or 12C filter chamber, also include a PG series pressure gauge, guard assembly and vent valve. The M and MT series pumps, constructed of polypropylene, are magnetically driven. The only moving part in the pump is the polypropylene encapsulated impeller magnet assembly, which rotates on an internal pure ceramic spindle up against a ceramic thrust washer. Because the pump is sealless, there is no leakage due to seal wear. An oversized priming chamber can be added to facilitate priming the pump. Penguin M series pumps are equipped with a six-foot cord and grounding plug on single-phase motors only. Three-phase motors are shipped unwired. PENGUIN CARBON TREATMENT SYSTEMS are designed for carbon treatment through filtration. Penguin Series CT filter chambers for removal of organic contamination from various types of solutions. Carbon chambers offer corrosion-resistance ideal for many O.E.M. and chemical processing applications, including most acids and alkalies to a maximum 230ºF. PENGUIN SERIES CTM AND CTL CARBON TREATMENT SYSTEMS are designed for large and high volume applications where a carbon pack is required. Following organic decontamination through the granular carbon packed bag, the solution is automatically depth filtered through 3 to 12 polypropylene cartridges per chamber, entrapping all foreign particles and solids. All chambers are constructed of heavy reinforced CPVC. This construction provides leakproof operation and easy carbon bag and filter cartridge replacement through the quick grip top knobs. No tools are required. The polypropylene carbon bag enables the maximum amount of granular carbon to be placed in each chamber. As a special Penguin feature, the carbon pack can be replaced with full length filter cartridges, thus providing a system with the flexibility for either carbon treatment/filtering or complete filtration. Various combinations of piping are offered from the simplest pump-filter combination to those which include drain, vent or bypass valves and tanks for filter aid or carbon mixing, priming or slurry additions and casters for portability. When dual carbon treatment chambers are supplied, they are manifolded with a valve system permitting simultaneous or alternate, independent or intermittent operation. Thus, single chamber operation allows the other chamber to be cleaned, completely eliminating down time. All Penguin carbon treatment systems are complete and ready to operate including drain, a Penguin series PG pressure gauge and guard assembly, 30 feet of reinforced hose, a set of short rods and filter cartridges for carbon treating, a set of long rods for straight filtration, and 40 pounds of Penguin series GC sulfur-free activated granular carbon for start-up operation. PENGUIN MFD SERIES FILTER SYSTEMS have been newly designed known for their leakproof filtering and circulating. Equipped with the Penguin MTD series polypropylene magnetic driven pump and the rugged Penguin CPVC, polypropylene or PVDF (Kynar) filter chamber, MF filter systems are designed for continuous trouble-free service. The smaller compact MFD filter system is excellent for complete corrosion-resistant filtration in laboratories, pilot plants, and production applications. The larger MFD filter system provides a high volume, high pressure filter system available with casters for portability. Penguin MFD filter systems are easy to clean. The MTD series pumps are constructed of polypropylene and magnetically driven. The only moving part in the pump is the polypropylene encapsulated impeller magnet assembly. Because the pump is sealless, there is no leakage due to seal wear. An oversized priming chamber can be added to facilitate priming the pump.